What is a Golf Proficiency Certificate? A golf course designed for competition is about 5,000 to 6,500 metres and a flight of 4 golfers will takes about 4 to 5 hours to complete a social game. To go on the golf course to play for the very first time, the golfer needs to achieve a certain physical swing skill. The basic skill the golfer must possess is to be able to hit and airborne the ball toward the target, the distance is secondary. This basic skill requirement is known as swing “Proficiency”. As there are many golfers playing on the course, and so that everyone on the course can enjoy their game, it is therefore imperative that each and every golfer possess this swing proficiency so that no one golfer will be likely to slow down the game, thereby making other golfers unable to finish their game on the course in time. More over if a golfer is hitting the ball everywhere, it can endanger other golfers on the course. In some golf courses producing a Proficiency Certificate is mandatory prior to playing. Where can I take a Proficiency Certificate? 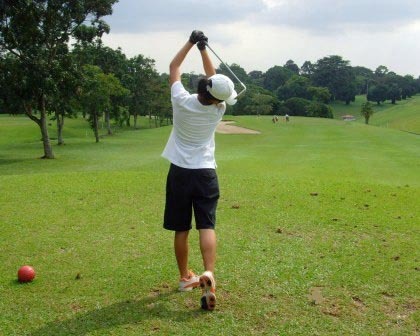 For the beginner golfers, there are public golf courses that conduct this “Proficiency Test” and a Proficiency Certificate (PC) will be issued upon passing. The test requires the golfer to know the etiquette and rule of the game. Etiquette is the long established procedures and customs about how the game is played. Other aspects of the game’s etiquette are courtesy, safety, responsibilities, consideration for other golfers and care for the golf course. A golfer must exhibit the swing consistency and how to behave and conduct oneself orderly on the golf course. The test may require the golfer to play a few holes to prove the competency. On the contrary there are so many resorts with golf courses in the world and especially in the neighbouring countries that are open to walk-in public for them to enjoy a round of golf game. These courses do not require golfers to produce a PC or the Handicap Card (official level of playing skill in the competition). "Achieving the Golf Proficiency Certificate (PC) is the first step of a golfer's endeavour"